~ Have you ever made a foolish financial transaction and hid it from your spouse? ~ Have you loved your son, but disliked his choice of wife? ~ If you loved a man, but knew that his mother didn’t like you, what would you say to a marriage proposal? ~ Do you sometimes yearn to be an accepted member of the inner circle? ~ Should a pastor have nice things? ~ Has a formerly close friendship changed because your friend was promoted and you couldn’t deal with the differences in your situations? Anthony Trollope’s Framley Parsonage, the fourth book in the Barsetshire novels, leaves the theme of class divisions and explores the complete orbit of ambition. Tolstoy’s Anna Karenina takes the reader through every stage of an affair, from the stolen glances across the room to the clandestine meetings to the pleasure of consumation. Tolstoy accurately narrates the zest and tingly shivers that accompany illicit love. Then he carries the story to its logical conclusion; the eventual boredom of the relationship, estrangement from family, the problem of the children, the loss of respectability, the loneliness of self-imposed banishment and despair that ends in tragedy. I thought of Anna K as I read Framley Parsonage. Mark Robarts is a nice guy: a young, well-established vicar with a growing family and a generous patroness. He is invited to a party of the upper crust, unscrupulous high rollers, and also asked to preach a sermon at their church. The invitation to preach legitimizes whatever questions may be raised by the company he would keep. Robarts is naive; he is manipulated; he is outrageously foolish. Mark thought he could touch pitch and not be defiled. After he is entrapped, he muddles around, scrambling to cover and hide his situation. When his courage builds to the point of facing his wife, confessing his foibles, and enduring public embarrassment, we admire and enjoy this country vicar and adore his wife Fanny. Trollope always writes with humor, clarity, and a supreme understanding of human nature. His tone is warm, not preachy; he is funny! Yet in his humor, he is serious. He likes women who are “ready-witted, prompt in action, and gifted with a certain fire” not “missish, and spoony, and sentimental”. He unveils many forms of pride: the refusal of poor Mr. Crawley to accept needed help; the idolatrous pride of mothers in their children; the haughty statue of a girl whose only desire is to sit and be admired; the difficulty of a stubborn aristocratic mother to admit her judgment was wrong. The entertaining subplots add interest without distracting from the main storyline. The wealthy heiress, Miss Dunstable, is adroit at batting off marriage proposals with her “I am much obliged to you”s until she receives a most unusual love letter from a hero of a previous book. Young Lucy Robarts is a genius in dealing with a potential mother-in-law problem. If you’d like to know her solution, email me and I’ll tell you without spoiling it for the others. TBOI (tasty bit of information): Mr. Spurgeon makes a brief entrance. Discovering a new favorite author is one of the joys of the reading life. It’s like receiving a box of chocolates which should last several weeks, but tastes so good that it is rapidly disappearing. The locus of the first two books in Trollope’s Barset Chronicles, The Warden and Barchester Towers, is a cathedral city. The conflicts of diocesan appointments, the juxtaposition of humble clerics with self-serving ecclesiastical climbers, and the quest of three very different men to marry a wealthy widow carry the narrative along. The setting in Dr. Thorne is out in the countryside where landed gentry struggle to maintain the purity of their class connections and suffer from want of money. To this strata of society every potential marriage is evaluated by the ability of the person marrying into the family to provide either increased prestige or an infusion of cash. One phrase surfaces repeatedly: “Frank must marry money.” Unfortunately, the woman Frank loves does not have money; therein resides the conflict to be resolved. Opposite the gentry are the merchants, manufacturers and professionals who insist they are equal in dignity to the Earls, Counts and Baronets. Wealth is a passport into the aristocracy, but a man like Dr. Thorne holds stubbornly to his right to enter into the society of anyone regardless of his own birth or wealth. Class consciousness is everywhere in this novel. Even in those bitterest days God tempered the wind to the shorn lamb. It would have behoved him, as a physician, had he had the feelings of a physician under his hat, to have regarded his own pursuits in a purely philosophical spirit, and to have taken any gain which might have accrued as a accidental adjunct to his station in life. The Victorian Web is a good resource to learn more about Trollope. Contributors include P.D. James, Antonia Fraser, Paul Johnson, Maeve Binchy, and Louis Auchincloss. P.D. James has written an introduction to Dr. Thorne here. The Barchester Chronicles is a 1982 BBC mini-series adaption of Anthony Trollope’s The Warden and Barchester Towers. Donald Pleasance does a fine job portraying Septimus Harding, who must be a good guy since he plays the cello. 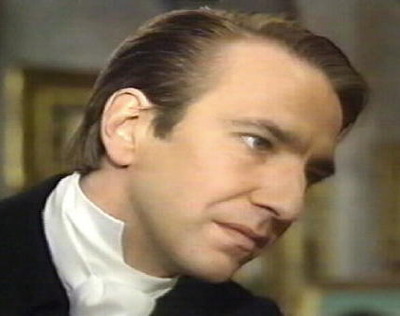 A young Alan Rickman enters the story in the third episode playing the filmy chaplain, Obadiah Slope. The pace of the series is agonizingly slow at times, and the style of videography is reflective of both 1982 and the BBC: slow pans, very little background music, single camera shots. If you are itching for action, watch National Treasure; get the itch out of your system before you sit and savor this slow, sweet film. With that caveat given, I can rave about this wonderful DVD. Lawyers and lawsuits occupy the first two episodes. Twelve bedesmen are persuaded to make a class-action suit against our cello-playing hero, who is the warden of Hiram’s Hospital, an almshouse for aging workers. One man is loyal to Mr. Harding and tries to talk them out of the suit. The relationship between our dear Mr. Harding and his younger daughter is a lovely portrait of mutual devotion and respect. The man who loves this daughter has been cast in an adverserial role to the warden. My beloved Latin teacher thought I would enjoy reading Anthony Trollope. Since he and his wife have a 100% record for recommending good books, I perked up and began looking. My rural library had one offering (on tape) of Anthony Trollope and a huge selection of Joanna Trollope (a descendant of AT’s). I listened to An Old Man’s Love with great enjoyment. Next, I logged on to Librivox and listened to The Warden, the first of his six Barset Chronicles. Barchester Towers is the second book in the Barset Chronicles. Happily, I purchased this book and could make it my own by marking it up. I like Trollope better than Dickens, and I like Dickens very much. Trollope, like Dickens, employs descriptive names: Mr. Slope for an oily clergyman, Dr. Fillgrave, Mr. and Mrs. Quiverful, Dr. and Mrs. Proudie. Trollope doesn’t surpass Jane Austen, but then who does? What’s An Austen Reader Supposed To Do? So you love Jane Austen. You’ve read all her novels and plan to re-read them with great pleasure the rest of your days. When you come to the end of Austen, you always have an appetite for…more! You start in with the Brontes and read through their works. This is a good thing. There are many, many good books in different genres, true. But there are times you want a nice cup of tea and a little touch of Britain in the night. It was because Anthony Trollope’s name was said in the same sentence as Austen’s, and from a friend I trust, that I decided to go exploring. I’ve only read one book (audio book), so I’m no Trollope expert. But–BUT– I thoroughly enjoyed An Old Man’s Love, which was unfortunately the extent of our rural library’s Trollope collection. This work seems a little obscure: Frank Magill’s Cyclopedia of World Authors didn’t list the title among Trollope’s principal works. An Old Man’s Love was a sweet romance, a lovely love story. Here’s the gist: A young woman, Mary Lawrie (20 something), is left orphaned. A friend of her father’s, the 50 year old bachelor, William Whittlestaff decides to take her in and provide for her. He falls in love with her and asks her to marry him. She hesitates and acknowledges to him that her heart is with a young man, John Gordon, from whom she has not heard a word in three years, and with whom no words of love were ever exchanged. Whittlestaff presses Mary, confident that her infatuation was a childish one and sure that he can give her a good life. She reluctantly agrees and decides to do her duty to the man who has been so kind to her, a man for whom she has genuine affection. Within hours of giving her promise to marry Whittlestaff, John Gordon, home from the diamond mines, knocks on the door asking for Mary. The ensuing conflict between Mary’s love for Gordon and her promise given to Whittlestaff occupies the rest of the book. A promise is a promise! Trollope portrays so accurately that inner impulse to be a martyr that seems so noble at night, but sticks like a bone in the throat in the daylight. Hearing the tale unfold was like riding a see-saw; it was impossible to guess how it would come out. Each man is so certain that it would be in Mary’s best interest to be with himself. There are two Dickensian characters, the housekeeper and the vicar, which add comic relief to the drama. “His great, his inestimable merit was a complete appreciation of the usual.” Henry James on Anthony Trollope. It isn’t the satisfying protein of Austen, but we still need some carbs in our life, and Trollope is a good carb.